My question in response is 'how do you define 'the best person'? The term 'the best' suggests that there will only ever be one person who fits that criteria. And of course we all want the best. But what if my version of the best is different from yours? Let me use an analogy of a netball team as this is something I'm very familiar with. My netball team needs a new GS. One version of 'the best' person might be person A who has a 100% shooting average. You can't win a game if the goals don't go in, right? But what about person B who shoots at 90%, but also brings great leadership skills and can also play GK. Is person B lowering the teams' standards, or are they bringing an offering that may in fact be more valuable? Venus was one of the biggest and most well known chocolate companies in the galaxy. Their chocolate bars were extremely popular, and the time came to bring a new chocolate into their team. The big boss team from Venus were excited to conduct interviews with suitable candidates. They were looking for a chocolate with high quality cocoa and the right balance of sugar. But they also wanted something a bit different and special to bring a new flavor to their team. As the first chocolate candidate waltzed through the door, the team was impressed. Silky had exemplary cocoa references and was sweet to perfection. But the team felt that she was too similar to the rest of their chocolates. She certainly met their high standards, but would she add anything new? The second candidate Zappy was equally well qualified. His cocoa levels exceeded requirements and his sweetness was in the Goldilocks zone. He was hard to fault and already looked very similar to the other chocolates, so the team was sure he would fit in well. But again, was he just a little too similar? When the third candidate rustled into the room, the team was taken aback. Knobbly certainly looked very different to the rest of the chocolates. Her cocoa levels were lower than required, and the team wasn’t sure about the sugar balance either. Clearly Knobbly would drop their standards. But Knobbly wasn’t going to be discarded so easily. She knew that the team was looking for something different, and she had a trick in her packet. For Knobbly wasn’t even a chocolate – she was pet food! Knobbly convinced the team to diversify their ideas. To think outside the box. And to realise that embracing diversity wasn’t about lowering standards, but about reaching new heights in different areas. Venus became one of the largest and most successful manufacturing companies in the galaxy. Who's Truth is the Truth? I have to say that I love testing new scientific toys. My latest acquisition is a set of Propeller Aeropoints. This is a set of ten foam targets with embedded GNSS that we place out in an area of interest before conducting a drone mapping mission. Why? Although my drones have onboard GNSS units, they are not always very accurate. This can make it difficult to know the exact location of a feature, and particularly challenging when trying to line up images to investigate changes over time. 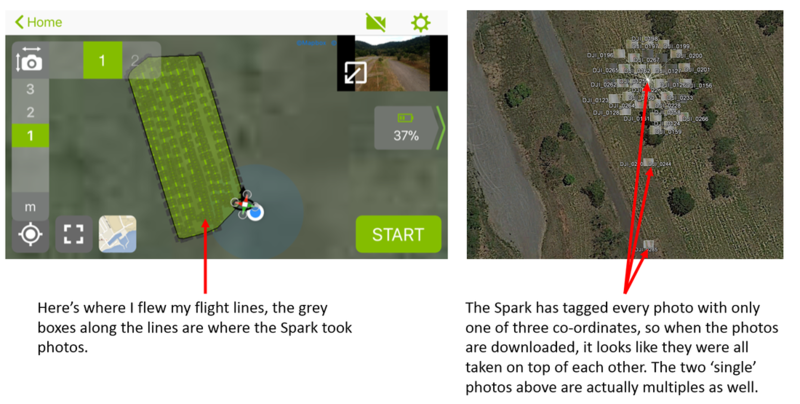 The aeropoints log their X,Y,Z location, and this can be used to correctly align a drone image mosaic. Each Aeropoint is 0.5 x 0.5 m in size and despite being foam, it is a little heavier than expected, especially when impersonating a packhorse (does this make it ‘imanimalating’?) and carrying all ten. However, the weight is important as well so that they don’t blow away. Which they certainly don’t. Their low profile also ensures that they don’t move once set in place. Unless maybe in major winds, but in that case I wouldn’t be flying anyway. As for the size – well they need to be clearly visible in the imagery so they couldn’t be too much smaller either. Pretty much all you need to do is spread out the targets around the survey area, turning them on as you go. They need to log for at least 45 minutes to get a good position fix, so it’s important to do this before having a cup of tea and setting up the drone. Simply fly the mission when ready, and collect the targets when done! As you collect each one, it will attempt to upload its data via your mobile device. If you’re not within internet range it will continue to try to connect until it’s successful. It can then take supposedly up to 24hrs to process the location data, but in the trials I have run, they were completed and available almost immediately. Perhaps my favourite design feature about the Aeropoints is that they are solar powered. It’s a thumbs up for the environment and just one less set of batteries that I need to charge – I have enough of that to do with all of my drone equipment and other field sensors! So this is a really nice touch. My least favourite aspect of this technology is the limited coverage of the correction network. Certainly much of SE Australia is well covered, but with red dots depicting coverage areas, the rest of the country looks like it has measles. I emailed to ask them about this and received the response “We are continuously expanding and increasing the coverage of our network; and, yes, your feedback and suggestions on prospect areas to focus on would be much appreciated.” So hopefully this improves over time. Another note on their customer service while I’m at it. One of my Aeropoints was a dud, right out of the box. After checking a couple of things with them they quickly arranged a replacement, which arrived a couple of days later. Very easy. In terms of actual performance, we compared the X,Y,Z values retrieved from the Aeropoints with those obtained by a local surveyor and achieved very pleasing results. I don’t know the system that the surveyor was using – I’m waiting to hear back from them and will update when I find out. The clear 1:1 relationship between the two sets of observations was honestly better than I expected. Out of the total number of 30 observations (X,Y,Z for each of ten targets), 27 had an absolute value difference of less than 2.5cm between the measurements of the Aeropoints and the Surveyor. The biggest problem was that Target 8 had a 2m discrepancy in elevation. But noting that the surveyors data were recorded by hand, I have to wonder if this is an error in transcription given the close alignment of all other points. But otherwise how do we know who's truth is the truth? All in all, I'm pretty impressed with the Aeropoints and their ease of use. Given that my favourite field locations are out on the Great Barrier Reef, they will have limited immediate use for me as the correction network doesn't cover my sites, and of course the GNSS doesn't work underwater. Wouldn't that be awesome if it did! 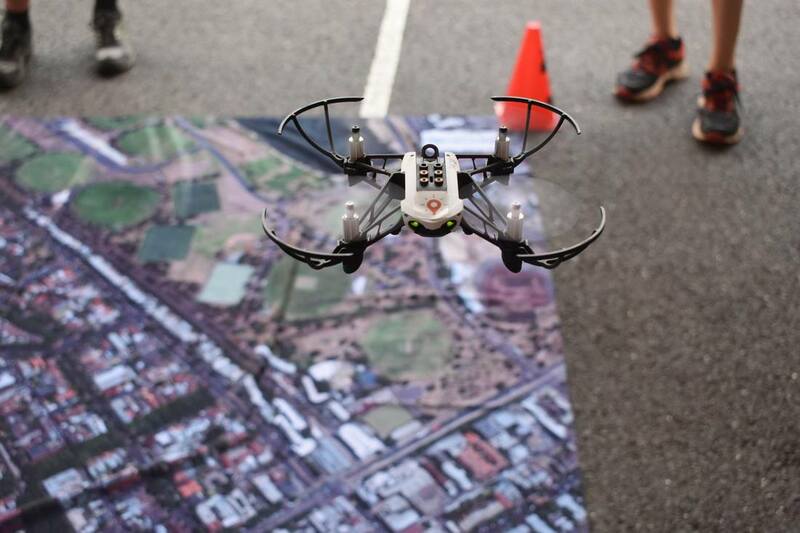 Thanks to Tom Watson from Droner for collecting the data to support this. As with many fabulous pieces of advice, it’s not rocket science. BUT it takes considerable skill to bring these little pearls of wisdom from the periphery of our consciousness to front and center in our mind. 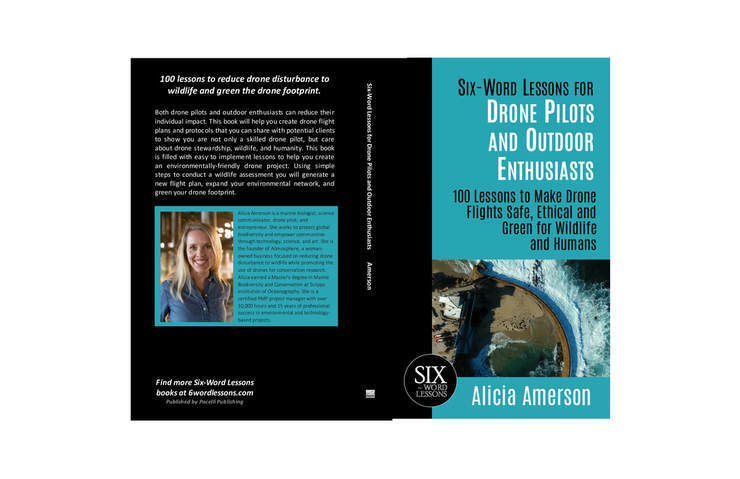 And that’s something that Alicia Amerson has done particularly well in her latest book ‘Six-word lessons for Drone Pilots and Outdoor Enthusiasts: 100 Lessons to Make Drone Flights Safe, Ethical, and Green for Wildlife and Humans’. This book is part of the ‘Six-Word Lessons’ series of books. I confess to not knowing anything about this style prior to reading her book, but it certainly makes for easy reading – even in a single sitting. The book is divided into chapters that are all named with six words. Each of her 100 lessons is also entitled with six words, followed by a short paragraph description. The crux of the book is that we all have a shared responsibility to care for our environment and those that live in it. 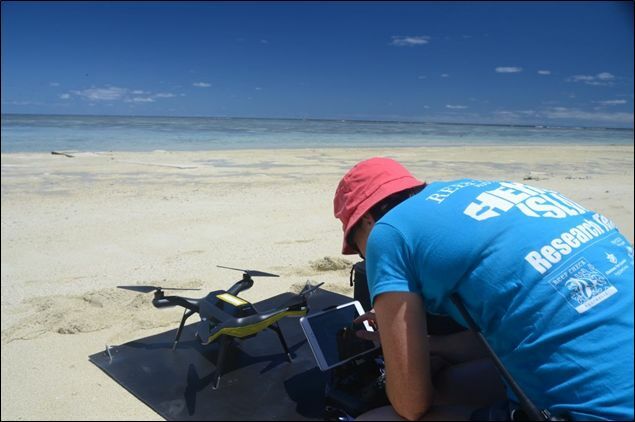 She explores this through understanding the positive and negative impacts that drones and their operations can have, with a particular flavor of wildlife protection. 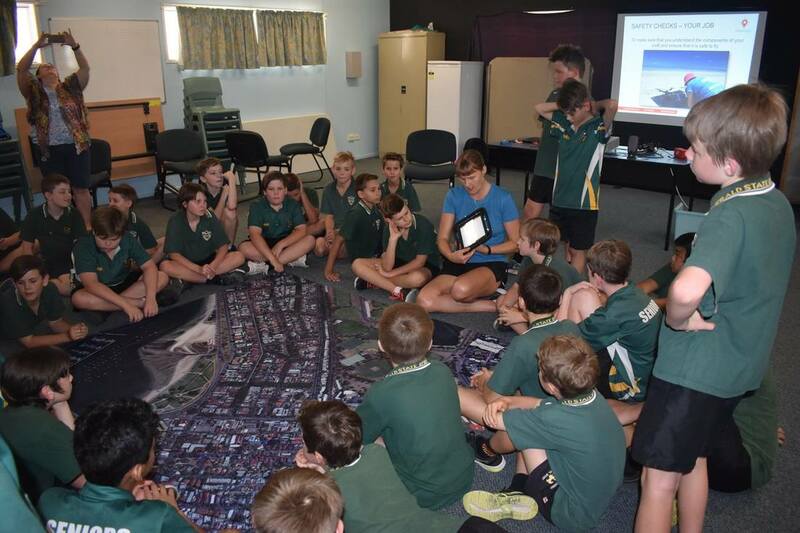 Alicia’s research and experience as a marine biologist and drone pilot make her an authoritative source on the potential impacts our behavior causes, and ways in which to mitigate those impacts. One thing that has stood out in my mind is that while you may not perceive an animal’s behavior to change, that doesn’t mean that a drone hasn’t distressed it. The example she gives is of a bear whose heart rate increased 400% in response to a nearby drone, despite showing no other visible signs of stress. She also points out that it is not only the drone noise, but the shadow and silhouette that need to be considered. 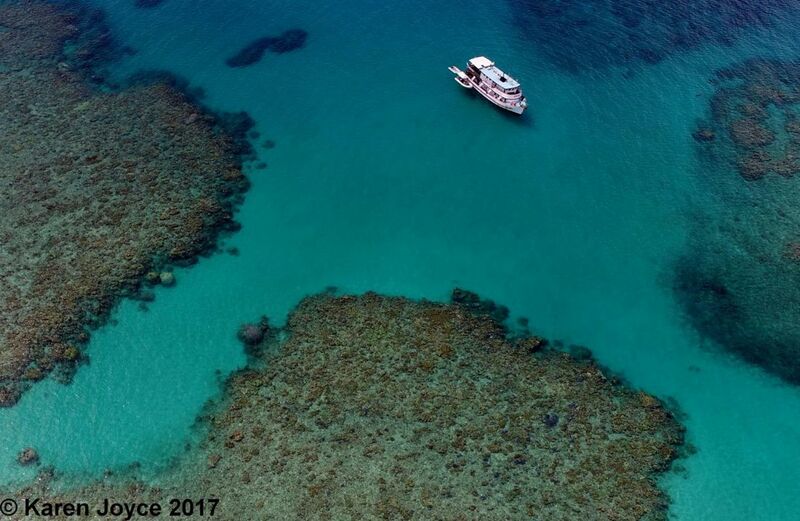 Now I work a lot on coral reefs and I have heard others say ‘don’t worry about the drone, boats are far more disruptive’. And they may well be, but I also don’t believe that we should say ‘don’t worry about cigarettes, ice is way worse’. I think that we should worry about both. And that’s not to say that drones shouldn’t be flown, but just that we should take care to do so respectfully. The power is in our hands to reduce our impacts. Alicia’s book is filled with common sense reminders, and little gems about animal behavior. 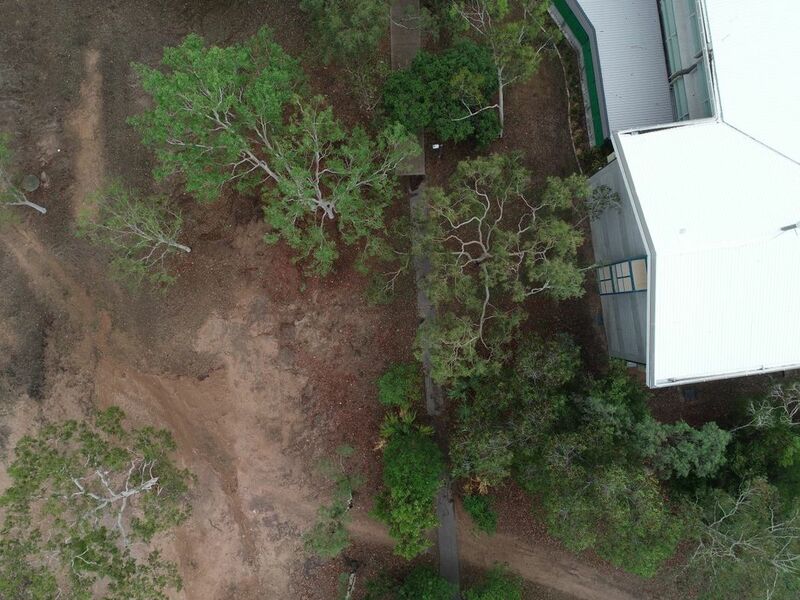 I love her ideas for ‘greening your drone footprint’, and I’m super impressed by the wealth of knowledge she has managed to distil into such a simple format. I highly recommend this as required reading for anyone flying drones in our great outdoors. For some time I've been fascinated by the marked temperature differences over short distances I can feel when swimming at the beach or on the reef. This clearly happens at scales that are far too small to be detected by satellite imaging sensors. As I'm also interested in coral reef dynamics, I am curious to know just how these fine scale variations may play a part in affecting coral health. Temperature loggers are one way to look at this, but they are always going to represent discrete points compared to an imaging sensor that can measure a continuous surface. An airborne thermal imaging sensor is therefore the only way that I can start to investigate this matter. Recently, a couple of miniaturised thermal sensors have come onto the market and are light enough to be carried by off-the-shelf drones. I've been dabbling with drones for a couple of years now, so it seemed the right time to see where I could take this. Last week I had the opportunity to test the FLIR Vue Pro on Orpheus Island, Great Barrier Reef, and here's what I found. The first thing to note is that the FVP does not come with a power supply or battery, just a mini USB input cable. So obviously to use it, you need to have a way to power it. Mains power is clearly restrictive, but is fine for getting familiar with the camera. For a mobile option, I bought a USB power pack ($30). 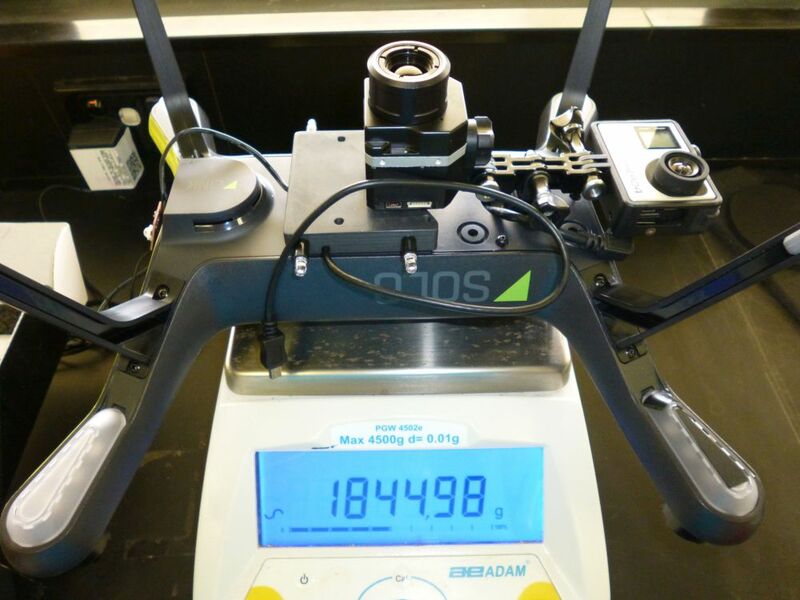 At 80 grams, this could be attached to the drone, but it's still a lot of unnecessary weight. Luckily the 3DR Solo has an accessory bay that's built for exactly this sort of thing. For the lighter option of 65g, a colleague made me a mini USB connector that also includes navigation lights for the Solo (it's severely lacking in this regard, and I plan to fly at night). We have some work to do in giving this some finesse especially as we weren't sure how long the USB cable needed, but at least we now have power to the camera. How to mount the camera was the next main decision. It comes with a GoPro attachment ring / collar that fits under the lens. This is fine if you want to mount it on the Solo facing forward, but for mapping purposes it doesn't provide enough clearance from the hull. I opted instead to use a tripod-to-GoPro adaptor which then allowed the necessary clearance. Unfortunately when every gram counts I'd rather not have this added weight, but short of building a specific mount with not enough time, this will do the job. Next I wanted to see if I could fly both the GoPro and the FVP at the same time. To do this, I bought a dual mount and fitted the GoPro to the front of the craft while the slightly heavier FVP was closer to the centre of gravity. Taking care to use the shortest GoPro connector screws possible, this complete set up (including lights) weighed 1.84kg, just 20g more than the standard gimbal + GoPro configuration. This is still within the expected MTOW of the craft. I can fly this set up in the hot and humid tropics for approximately 12 mins, while retaining at least 20% battery at the end of the flight. With the hardware largely figured out, software was the next challenge. The FVP App is pretty basic to be honest, but it largely does the job. I was having some troubles with it initially, but an update came out last week that largely solved the issues. I learnt to just ignore its warnings. Within the App, it's possible to change colour palettes, dynamic range, and output format (jpg or tiff). I use the white hot palette as I'm not concerned about the display, I just want the actual data in the pixels. I can always display it as different colours later if I wish. The app is used to switch between video, image, or time lapse modes. Images can be set to acquire as frequently as 1/sec up to 1/17 secs. Data are written to the 32GB included mini sd card in the camera. The biggest miss on the app is that there is no live feed of the imagery. This is a real pain when trying to work through the different settings - without the immediate feedback of the effect of a setting change, it's like learning old school photography again and having to wait until your film is developed before you can see the results. There is the facility for a mavlink cable (provided), so a feed should be possible via the drone itself though I didn't test this out as its not a simple plug in. The App uses bluetooth to connect to the FVP. Once you have the recording started, you can manually switch the blue tooth off. Alternatively, I do like how the Bluetooth automatically disables itself after two minutes of the App being closed so that it cannot otherwise interfere with the flight controller. Yet even with the App closed, the FVP continues to record data and you can see this by a small flashing light on the camera itself. Downloading the data is super easy. Simply get a mini SD card adapter and plug it into your computer. My files were all 643KB ea. But that's when things got a little more challenging. I wanted to geotag each image based on the Solo telemetry data. This is usually pretty simple in Mission Planner - at least for my GoPro data. But MP couldn't match the image acquisition times with the GPS data. I suspect it is something to do with the format, as the time stamp on each of the TIFFs looked fine to me. I had to assume that it was auto-syncing with the tablet that I used to control it as I couldn't find a way to otherwise change it. I then tried again to geotag with Geosetter, and that worked so clearly there's nothing wrong with the files, but something wrong with Mission Planner reading their metadata. I also realised that each image actually HAD a geotag initially, but that it was set at 0,0 lat/long. That totally messed up our attempt to mosaic in Photoscan without fixing that first. Given that the imagery I acquired is not the standard type that Pix4D or Photoscan can easily mosaic (i.e. it's hard to automatically find control points over water) we are certainly having some challenges there. Once I've sorted it all out, I'll post a blog specifically on that. In the meantime, I am happy that the camera is sensitive to what I need. Early views of the data are really promising! The top of the range FVP is radiometrically calibrated. The one that I received was radiometrically capable but not yet calibrated. Quite a bit cheaper... For many applications, relative temperatures may be just fine, but I wanted absolute. And as I have a fully calibrated FLIR A65, and access to temperature loggers, I performed my own calibration. I used a couple of Chinese takeaway containers filled with iced water, boiling water, and something in between, all inside a black box tucked inside a storage cupboard - somewhat similar to Harry Potter's bedroom - with the lights out. The FLIR sensors are sensitive to reflected light in the 8-14um range as well, so I wanted to get rid of that and only have the emitted temperatures. I used FLIR Tools for the A65 (below) and took photos of the same area with the FVP using the App. I still have to model the correction - another post again! Studying is tough, I get that. I've been there, and I don't envy you! I felt nervous as I watched you walk into the exam room - I'm sure you felt much worse though. But you'll be relieved after two hours - it's then that my pain begins! I receive your exams with a mixture of anticipation and dread. Your assessment items are the ultimate feedback on my performance. I look at what you write, and I take it personally. Did I neglect to teach you something, or could I have explained a concept better? I share your wish to succeed. Far better to do something simple, and do it well, than to attempt to save the world and accomplish nothing. Good luck with your assessments! Last week I spent an entire day trying to sort out my Iris+ with Tarot gimbal / Go Pro setup. Yes, it's supposed to be plug and play. And it sort of was. Just not play properly. The issue I had was widely noted on the net: the camera / gimbal 'shuddered' and would not hold a position. Generally I could get it pointed straight down, or straight out, but nothing in between. And then in flight, it would randomly switch between down or out angle - perhaps it thought it could choose the camera angle better than I could! Indeed, there were some nice horizon shots! ​So back in the lab, I went back to the beginning to install and configure the gimbal. The reason I wasted so much time was because some of the websites that I visited had incorrect advice. Imagine that! This is the best site to use. There are several, many with incorrect advice (including the 3dr official site!). If the gimbal shudders (mine did! 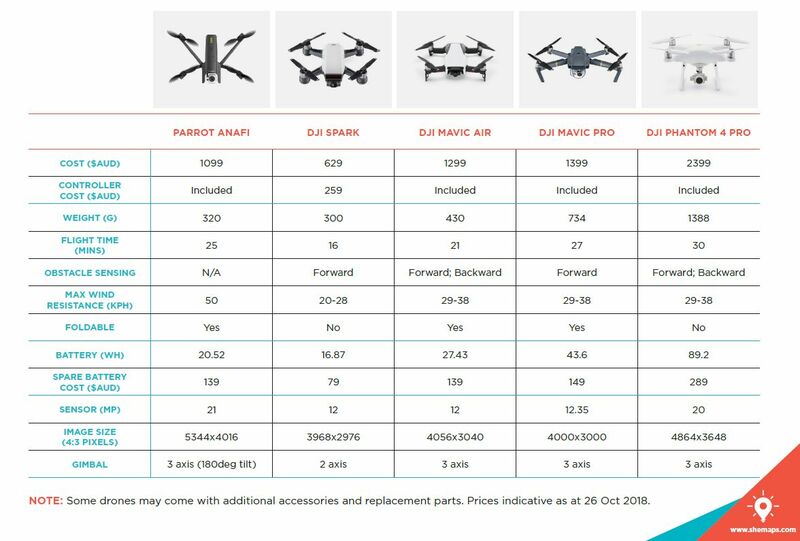 ), upgrade the gimbal firmware as per above best site. Note the importance of NOT connecting to the power source until AFTER you start the upgrade. Weird hey. It's shown perfectly in the video below. When trying to configure the gimbal, if you get a prolific USB to serial error, follow the directions on this page. I tried links from other pages as well but they didn't work. This was definitely the best one. Once you've done all this, if the camera is not pointing in the correct direction, you need to re-calibrate it. Point it straight upwards towards the belly of the platform. Click on 'calibrate sensor'. This is shown in the video below as well. If I had used the ardupilot wiki in the first place, then I would have saved myself a lot of time! For those sifting through the sea of advice on this matter, hopefully this confirms for you which recommendations to follow.